Dubai, UAE, September 24, 2018: The eagerly-awaited 2018 edition of GITEX Shopper - the region’s favorite and longest-running consumer electronic bonanza - is offering gadget and technology buyers the chance to access the best electronics deals and promotions available in the region when it opens next month. Returning to Dubai World Trade Centre (DWTC) for 2-6 October in Za’abeel Halls 4-6, the Autumn 2018 edition will debut four new Xperience Zones for the first time, designed to provide visitors with the knowhow to make informed purchases during the show. For one of its sections in its new Xperience Zone, the GITEX Shopper team has recruited an army of techsperts from Tech Radar to assist shoppers on the best products to purchase, while a series of Tricks & Tips sessions will see the techsperts offer support, guidance and tips on getting the most out of electronic purchases. From providing tricks on switching between Android and iOS, to taking better photographs on your mobile, GITEX Shopper visitors can get exclusive insights through numerous free-to-attend panel sessions. There will also be an opportunity to check-in for one-on-one advice about the latest smart phones, laptops, tablets, TVs and more. Making its debut this year is a five-day blitz of video gaming tournaments expected to be contested by more than 400 would-be champions from across the UAE and beyond. Additionally, the Xperience Zone will feature an ‘Unboxing’ demonstrations streamed directly from the show. Making a guest appearance will be the award-winning content creator, YouTuber and Technologist, EMKWAN, who has amassed almost 44,000 subscribers. Taking technology to new heights, the final section of the Xperience Zone - the Shopper Drone Zone - will offer novice and expert drone operator’s first-hand training on how to operate a drone without crashing it in a safe skills-based area on the show floor. Visitors who love the experience can then pick up a drone of their own at incredible GITEX Shopper prices. With recent Euromonitor data revealing the UAE’s consumer electronics market is expected to post annual sales of AED12.3 billion by 2021, smartphones, laptops and HDTVs – the long-time favourites of GITEX Shopper crowds – remain the most popular consumer electronic items in the Emirates. In-home and in-car electronics also continue to post strong sales, with the International Data Corporation (IDC) forecasting Middle East and Africa consumers will spend in addition of USD300 million on smart home technologies this year. 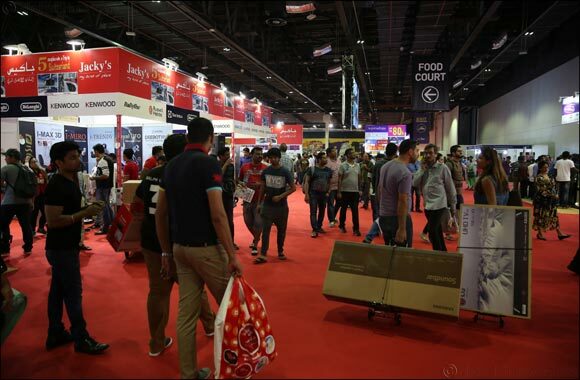 According to research conducted by DWTC following last year’s event, 78 per cent of GITEX Shopper visitors revealed they typically delay vital consumer electronics purchases until the show, with 81 per cent insisting a preference to buy at the show over physical and online retailers. “During the five-day event, we are expecting a surge in demand for gaming laptops, thin and light laptops and gaming products, digital cameras, ultra-large televisions using OLED and QLED technologies, as well as high-end smartphones from leading brands,” said Atul Joshi, Head of Distribution at Jumbo Electronics. “Aside from the bundle offers, GITEX Shopper visitors can enjoy the benefits of JumboSalama, an extended warranty that covers any product defects and physical damage for up to two years. Jumbo Unwired Crew, a team of qualified, experienced and trained tech experts, will also be at GITEX Shopper to assist visitors through gadget-related set up issues via smart solutions, streaming services and voice assisted solution,” added Joshi. “As always, we are very excited to be a part of GITEX Shopper, an event which brings together people from across the region. The anticipation ahead of the October edition will drive further sales and interest, and we are gearing up to provide added value to those who attend,” said Mahesh Chotrani, Assistant Vice President, Jacky’s Electronics. As part of revamped Shop & Win concepts, GITEX Shopper 2018 is rolling out additional competitions across the show and its social media platforms, including stage activations on an hourly basis every day, and the Shopper Price is Right. Prizes available include an MG ZS Compact SUV, 50x AED1,000 Dell vouchers, and a daily holiday package to Tbilisi in Georgia, Baku in Azerbaijan, Yerevan in Armenia, Goa in India, and Herzegovina in Bosnia. Running 2-6 October, GITEX Shopper 2018 is open daily from 11:00am - 11:00pm. Tickets are priced at only AED 20, a reduction on last year. Entry is free for children below the age of five. Creating even more convenience for visitors, GITEX Shopper 2018 is offering six hours of free parking at DWTC to those who spend more than AED300 at the show.